The explosive increase in the prevalence of diabetes mellitus in resource-strapped regions of the world demands innovative solutions in healthcare. Advances in information technology, diagnostics and food technology have the potential to make diagnosis and treatment of diabetes simpler, cost-effective and patient-friendly. Newer methods of glucose testing such as the ambulatory glucose profile promise to make clinical decision-making easier and more robust. More advanced modes of insulin delivery are likely to help larger proportions of patients achieve their glycaemic goals with minimal risk of hypoglycaemia. Use of telemedicine and electronic medical records represents a significant advance in improving delivery of diabetes care and monitoring its outcomes. Efforts are also on to harness the wide penetrance of mobile phones in spreading awareness about diabetes and its prevention as well as in screening for retinopathy. Advances in technology also promise to favourably alter the food habits of the population, with the advent of the novel high-fibre white rice being a case in point. This narrative review aims to discuss some of the ways in which emerging technologies are making diabetes monitoring and treatment easier, more effective and pleasant for the patient. The incidence of diabetes mellitus is increasing at an alarming rate worldwide. It has been estimated that 415 million people have diabetes as of 2015, and this figure is expected to increase to 642 million by 2040. According to the recently published ICMR-INDIAB diabetes prevalence study, the overall prevalence of diabetes in India is estimated to be 7.3% and the prevalence of pre-diabetes to be 10.3% based on the WHO criteria or 24.7% based on ADA criteria. In its first global report on diabetes, WHO recommends strengthening of the health system's response to this chronic disorder as diabetes and its complications can bring about extensive fiscal loss to people with diabetes, their families, health systems and national economies. Caring for these vast multitudes of people with diabetes is challenging, particularly in developing regions of the world where health-care facilities in the form of workforce, material and money remain scarce. Technological innovations offer immense promise as a mean for fulfilling unmet needs in the field of diabetes care. Recent advances in diagnostics, information technology and nutrition and food technology have revolutionised the way in which we look at holistic diabetes care. There have been tremendous advances in the use of technology for the management of diabetes over the past 30 years. Technologies most commonly reported are in the arena of needles and injections used in insulin delivery and devices that can manage blood glucose and prevent long-term complications. It is a mobile world. Smartphones are everywhere, giving more people instant access to information at their fingertips. This trend has led to growing popularity and use of mobile health (mHealth) technology. mHealth technology is making health care more accessible and more flexible, places more power in the hands of patients, and is contributing to greater efficiency at medical practices. The field of telemedicine has also changed drastically from its inception. Some years ago, a few hospitals started experimenting with telemedicine to reach patients in remote locations. Telemedicine has now transformed into a complexly integrated service used in hospitals, private physician offices and other health-care facilities. It has been used to overcome distance barriers and to improve access to medical services that would often not be consistently available in distant rural communities. Similarly, use of electronic medical records (EMR) can transform the way healthcare is delivered. 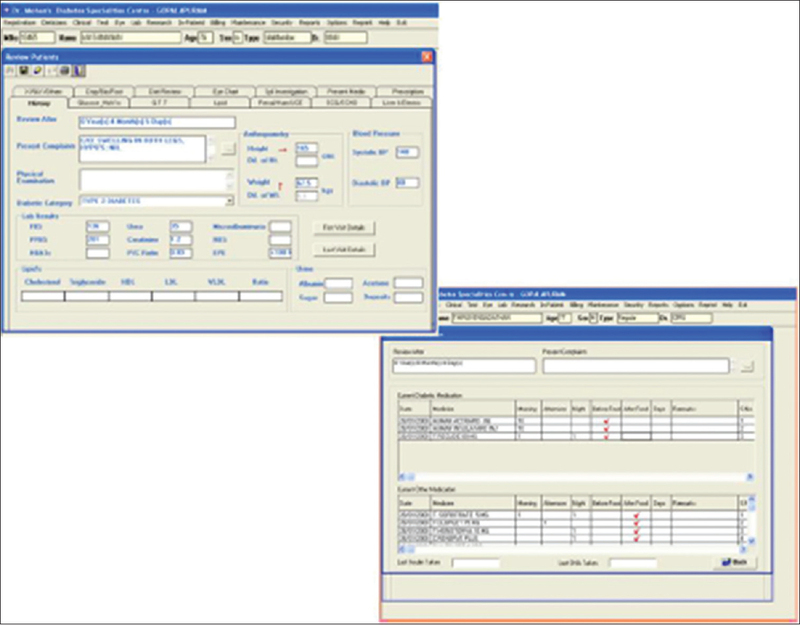 EMR is a patient-centered record, which contains medical, and treatment history of the patient and this information can be made available online whenever it is needed, to authorised users. This narrative review discusses some of the ways in which emerging technologies are making diabetes monitoring and treatment easier, more effective and patient-friendly. To define the role of food technology in the management of diabetes. This is a narrative review. The review combines the findings of literature retrieved from searches of computerised databases, hand searches and authoritative texts. All information presented were obtained from journal articles, websites, product pamphlets and product company websites. We searched for studies published before 30th April 2017, on PubMed, Google Scholar, Reviews and also product websites like www.myfreestyle.com. To ensure a broad search we used the keywords 'diabetes management,' 'prevalence,' 'technological innovations,' 'insulin delivery systems,' 'mhealth,' etc. While capillary glucose meters have been used in clinical practice since the 1960s, their widespread use started only in the 1990s after technological improvements led to a reduction in the cost of the meters and reagent strips. The latest glucose meters provide results that are comparable in accuracy to the venous plasma glucose estimations, at comparable or even lower costs. The advent of inexpensive meters and strips has made self-monitoring of blood glucose an integral part of diabetes care, particularly in patients who are on insulin. While the use of capillary glucose meters for the diagnosis of diabetes is not recommended in the clinical setting, it may be utilised as the only feasible method in large epidemiological studies particularly in resource-constrained parts of the world. Technological advancements over the years have led to enhancement in blood glucose meters [Table 1] and [Table 2]. While fingerstick glucose monitoring is easy to perform and acceptable to most patients, some are discouraged by the pain associated with the finger prick. Furthermore, frequent lancing of the fingers may not be acceptable to individuals whose professions involve fine movements of the hands. This has led to the development of 'alternate-site' testing, where blood for measurement of glucose is obtained from sites such as the forearm. Specialised lancets have been designed for extracting blood from these sites, and the values seem to correlate well with venous plasma readings., Unfortunately, rapid changes in glucose levels may not be as well appreciated in forearm samples as in finger stick samples. The concentration of glycated haemoglobin (HbA1c) is an alternate measure for the circulating glucose level over a period of 120 days. It is a marker of complications associated with diabetes and is therefore used as a clinical tool for monitoring of glycaemic control in people with diabetes. HbA1c is tested in laboratories and the patient needs to know the results before visiting a physician. This clinical process to assess patients takes more time and is also expensive. As an alternative, point-of-care testing (POCT) aims to provide immediate results at the time of patient consultation. POCT devices for HbA1c use a drop of capillary whole blood, collected through the finger-prick procedure. After applying the blood to the test cartridge, the sample is analysed within a few minutes. Some of the POCT HbA1c devices distributed by certified vendors in the market are: QUO-TEST A1C, AFINION AS100, COBAS B 101, DS5 and A1CNow. Currently, these are not only sold to patients directly but also being used in research studies and in clinical settings. The continuous glucose monitoring (CGM) system was introduced in the late 1990s as a means of measuring the day-to-day glycaemic excursions in patients with diabetes. The earlier CGM devices included a sensor inserted into the subcutaneous tissue, a reader which was worn by the patient and a computer software for generating graphs and reports on downloading the data from the reader. These had the disadvantage that they could be used only for limited periods of time and needed frequent calibration using finger stick (capillary) glucose estimations. Nonetheless, they emerged as useful tools in the monitoring of patients and were of immense help in deciding and adjusting the doses of insulin and other antidiabetic medications, as well as in the detection of hitherto unsuspected hypo- and hyper-glycaemic episodes. The subsequent generations of CGM devices also allowed for real-time assessment of glucose values, and could also be linked to a continuous subcutaneous insulin infusion (CSII) pump. The newest iteration of the CGM technology is termed the Flash Glucose Monitoring (FGM). 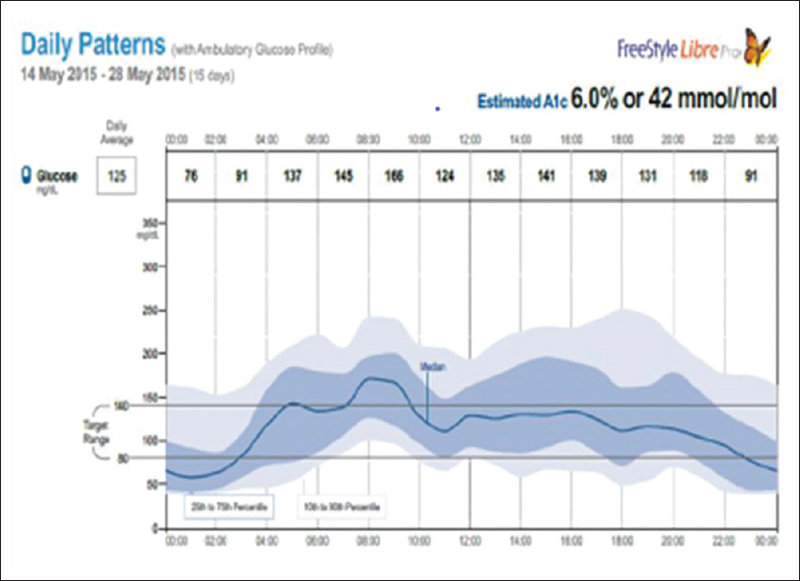 The FreeStyle® Libre device consists of a small sensor which is worn continuously by the patient for the duration of the profiling (up to 14 days). The glucose values recorded by the sensor are wirelessly transmitted to a reader (usually kept with the health-care provider) and downloaded in the form of graphs using a proprietary software [Figure 1]. The graphs provide glucose curves for each of the 14 days, as well as a 'modal day' curve prepared by collapsing the readings from 14 days into a single curve. The modal curve provides information on the median glucose value at different times of the day as well as on glucose variability, which can be ascertained by looking at the 10th and 90th centile curves [Figure 2]. The FGM is an improvement on the original CGM in its longer duration of recording and in that there is no need of calibrating with a capillary glucose meter. It is also far less expensive. The FGM is a useful educational and motivational tool for patients in addition to helping the clinician plan and titrate antidiabetic drug regimens. All patients with type 1 diabetes and many with type 2 diabetes require insulin therapy to control their blood glucose levels. Notwithstanding the tremendous advances made in insulin therapeutics over the past three decades, glycaemic control remains suboptimal in the majority of patients on insulin. A major reason for this paradox is that the currently used insulin regimens do not exactly mimic the physiological secretion of insulin from the beta-cells of the pancreas. The CSII pump represents an attempt to provide insulin in a more physiological manner to patients with diabetes, avoiding the peaks and troughs in insulin levels seen with multiple subcutaneous injections. The CSII pump includes a subcutaneous cannula inserted into the interstitial space (usually of the anterior abdominal wall), a connecting tubing and a small pager-sized, battery operated pump which has the insulin reservoir as well as a microchip that controls insulin delivery according to pre-programmed rates. The pump can be programmed to infuse insulin continuously at low hourly rates (basal infusion). The basal infusion rate can be adjusted to account for intra-day variations in insulin sensitivity as well as for exercise. The latest CSII pumps have the facility to set up to 48 different basal infusion rates per day, although most patients will utilise far fewer rates. In addition, at the time of meals or when blood glucose levels are found to be high, bolus doses of insulin can be administered (prandial or correction bolus). The pump also has bolus calculation 'wizards,' which help the user calculate the bolus dose based on the amount of carbohydrate consumed and the prevailing blood glucose levels. The latest versions of the pump are linked to CGM (see above), and some of these are even programmed to shut off insulin delivery when the glucose levels drop below a pre-specified threshold, and to reinitiate infusion when the glucose levels start to increase. However, there are certain risks involved with insulin pumps. Errors of insulin infusion can occur due to pump failure or insulin infusion set blockage, infusion site problems, insulin stability issues, user error or a combination of these. Users are therefore exposed to significant and potentially fatal hazards: interruption of insulin infusion can result in hyperglycaemia and ketoacidosis; conversely, delivery of excessive insulin can cause severe hypoglycaemia. Further developments of the CSII pump concept include the bi-hormonal pumps, which infuse insulin as well as glucagon-like peptide-1 or glucagon, and ultimately, the development of the artificial pancreas (AP). Unfortunately, the initial and recurring cost of CSII pump therapy makes it out of reach for the common man in many parts of the world. The AP is an automated system that mimics physiological functioning of the normal endocrine pancreas using pumps to continuously adapt hormone delivery based on changes in glucose levels which are measured by glucose sensors. The device uses continuous glucose measurements to automatically manage exogenous insulin delivery with or without other hormones in an attempt to restore glucose regulation using a control algorithm. This emerging technology enables hands-free, continuous, glycaemic control using digital communication technology and advanced computer algorithms. As of 2015, 18 different closed-loop AP systems were in development, with at least 2 expected to be available in the European market by end-2016. While dual-hormone AP appears more physiological in theory, it remains to be seen whether it offers real-life advantages to single hormone therapy, especially as it is associated with increased cost and complexity of the system. A recent randomised trial showed that single-hormone AP provided equivalent glycaemic control to dual-hormone systems, with no significant difference in hypoglycaemia rates. Insulin pens are more useful as they eliminate the need for drawing up a dose. The ability to dial up the desired dose leads to greater accuracy and reliability, especially for low doses which are often needed in the elderly. The sensory and auditory feedback linked with the dial mechanism on many pens also helps those with visual impairments. Pen devices are also more compact, portable and easier to grip. On the contrary, insulin pens are costly than the insulin vial. Patients may also find that pen devices take longer to use, as the needle should remain in the subcutaneous tissue for 5–10 s after dose release. Furthermore, not all forms of insulin are available in the pen device. Some other forms of insulin delivery are shown in [Table 3]. E-health has been the buzzword for a while and is the convergence of medicine and internet, commonly referred to as medical informatics or internet medicine. This includes the use of telemedicine, mHealth, smartphone photography and EMRs. According to a release by ITU in July 2016, developing countries now account for the vast majority of Internet users with 2.5 billion users compared with one billion in developed countries. Mobile phone coverage is now near-ubiquitous, with an estimated 95% of the global population (~7 billion people) – living in an area covered by a basic 2G mobile-cellular network. The Chunampet Rural Diabetes Prevention Project is a prime example of a telemedicine intervention for diabetes. This project, conceived and carried out by the Madras Diabetes Research Foundation with the support of the World Diabetes Foundation, the Indian Space Research Organisation and the National Agro Foundation, has been initiated in a cluster of villages in Tamil Nadu, South India. 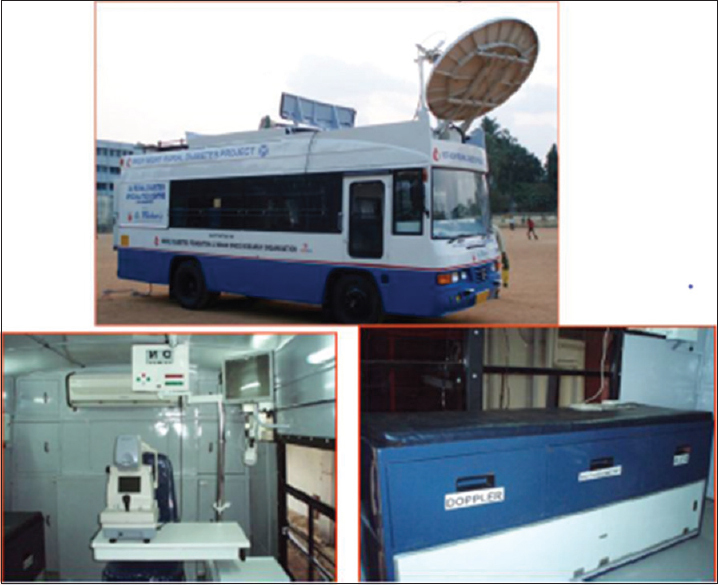 Central to this project is a mobile van which moves from village to village in the cluster, offering diagnostic and screening services. 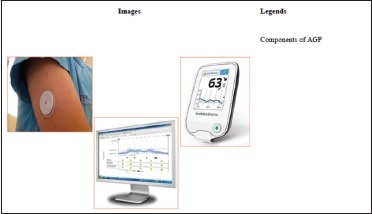 All individuals found to have diabetes are then screened for complications using equipment available inside the van (ECG, biothesiometer, Doppler probe) [Figure 3]. 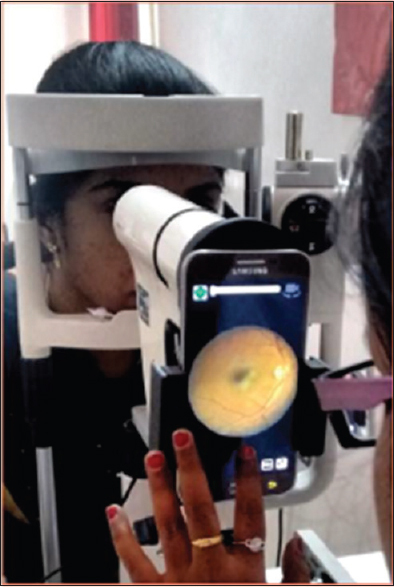 A retinal photograph is taken using a non-mydriatic fundus camera and transmitted to the main (urban) centre, where an ophthalmologist views and grades the retinal lesion, if any and communicates with the patient in real-time, using a satellite link-up [Figure 4]. A rural diabetes centre has also been set up in the area to provide follow-up care at low cost. With these steps, it was found that <5% of patients needed referral to an urban tertiary care centre for management of diabetes. Telemedicine has demonstrated to be a worthy tool to support health caregivers in the effective management and prevention of diabetes and its complications. In many developing countries, mobile phone penetrance is high. Transmission of health-care messages through short messaging services (SMS) is, therefore, an attractive and potentially effective means of bringing about behavioural change. The potential for regular and repetitive messaging is particularly attractive in cases of chronic diseases like diabetes, where patients need to monitor their lifestyle on a long-term basis. A prospective, parallel-group trial conducted in India randomised in 537 men with impaired glucose tolerance to receive frequent SMS on lifestyle modification (intervention group) or advice at baseline only (control group). At the end of 3 years, 18% of participants in the intervention group developed diabetes as compared to 27% in the control group (hazard ratio 0.64, 95% confidence interval 0.45–0.92, P = 0.015). This suggests that mobile phone messaging is an effective means of delivering lifestyle advice to prevent the development of type 2 diabetes, although longer-term studies are needed to see if these effects persist. Similarly, Arogya World Inc., in collaboration with Nokia (IT firm) carried out the largest diabetes prevention mHealth programme in the world by reaching out to more than one million people from all over India with text messages in 12 languages about diabetes and its prevention and management. They tested the program's effectiveness in bringing about behaviour change known to prevent diabetes and showed a 15% improvement in the composite scores for behaviour change post-intervention. Recent advances in technology have led to the development of mobile applications (apps) that integrate data on exercise (pedometer) and diet to provide appropriate lifestyle advice, motivation and encouragement to people with diabetes, as well as to facilitate communication with the healthcare provider. Well-designed studies are needed to evaluate whether these approaches lead to better outcomes in terms of diabetes control as compared to more conventional approaches. The search word 'diabetes' yields around 250 apps in the Google Play Store. These include physician directed apps, apps for teaching and/or training, medical management of diabetes, food reference databases, apps for tracking and displaying health information and social forums/blogs. There are even apps that claim to identify, if you have diabetes, by scanning your fingertip. Diabetic retinopathy (DR) is one of the most frequent complications of diabetes and is associated with visual impairment in a significant proportion of inadequately monitored cases. Four-field fundus photography using a retinal camera is considered to be the gold standard for diagnosis and assessment of DR. Unfortunately, these cameras are expensive and are cumbersome to carry around and set up, limiting their wider use in developing countries. Efforts have therefore been made to reduce the cost and complexities of retinopathy screening using smartphone-mounted retinal cameras (fundus-on-phone cameras) [Figure 5]. These instruments are compact and portable and far less expensive than conventional fundus cameras. Images can also be transmitted easily between various locations. Cameras compatible with commonly used mobile operating systems have been designed. Preliminary reports suggest that the fundus-on-phone camera is effective for screening and diagnosis of DR, and the results show substantial agreement with conventional fundus photography. Similarly, CAMRA study compared smartphone fundus photography, non-mydriatic fundus photography and 7-field mydriatic fundus photography for their abilities to detect and grade DR. It was found that the smartphone and non-mydriatic fundus photography are each able to detect DR and sight-threatening disease. However, the non-mydriatic camera was more sensitive at detecting DR than the smartphone. Diabetes is a chronic disease requiring lifelong follow-up and monitoring. Unfortunately, levels of glycaemic control have been found to be poor even among patients attending specialised diabetes clinics. Lack of well-formulated therapeutic strategies and non-compliance with guidelines (by both patient and healthcare provider) are the major reasons for patients not achieving glycaemic targets. EMR system, defined as 'the computerization of health record content and associated processes usually referring to an electronic medical health record in a physician office setting or a computerized system of files in a hospital,' has the potential to improve documentation of care, facilitate communication of clinical information across sites, and measure productivity and non-conformities in care provided. The utility of EMR systems in improving outcomes in patients with diabetes has not been unequivocally established; however, it is clear that use of these systems can improve processes and remove inconsistencies between care providers, or even between visit to visit to the same care provider., EMR is particularly useful in reminding care providers when a particular test [HbA1c, lipids, microalbuminuria, foot and retinal examinations] is due and in identifying patients who are persistently short of their targets so that that appropriate remedial action can be taken. The Diabetes EMR (DEMR) system has been integral to patient care at Dr. Mohan's Diabetes Specialties Centre, Chennai [Figure 6]. In addition to improving processes and ensuring the quality of patient care, the DEMR also facilitates data mining for clinic-based research. However, such a system is expensive to set up and maintain and is prone to bugs like any other software. Occasionally, use of computerised patient records may detract from the doctor–patient interaction, when the clinician spends more time looking at the computer screen than talking to the patient. Rice is the major cereal staple of a large chunk of the world's population. Developments in food processing technology most of the rice available in the market is of the highly polished white variety, which contains low amounts of dietary fibre and has a high glycaemic index (a measure of a foods items ability to raise the blood glucose levels). High intake of such refined cereals has been shown to increase the risk of developing type 2 diabetes. Motivating the population to alter their cereal staple is obviously impractical; therefore, the only feasible solution is to utilise advances in plant breeding and food technology to favourably modify the fibre content and glycaemic properties of rice. Minimally polished brown rice has been shown to have a lower glycaemic index compared to polished white rice, on account of its high fibre content. Unfortunately, brown rice suffers from low levels of consumer acceptance on account of its poor sensory properties and prolonged cooking time. Efforts were therefore made to develop a variety of rice which retains the favourable sensory and cooking properties of white rice but has higher fibre content and a lower glycaemic index. These efforts, utilising classical plant breeding techniques, have resulted in the development of a novel variety of high-fibre white rice from Chennai, south India. Widespread use of this rice variety has increased the dietary fibre intake of the population and may help protect against the development of diabetes and achieve glycaemic control in those who already have diabetes. This review sums up the technologies in practice for the management of diabetes. The review focuses on glucose meters, continuous glucose monitoring devices, insulin pumps, telemedicine, mHealth, smartphone-based retinal photography, diabetes EMRs and food technology. Over the past couple of decades, there have been far-reaching developments in the field of therapeutics, information technology, diagnostics and drug delivery that promise to make control of diabetes and its complications easier and more cost-effective. However, it ought to be remembered that any device or technology, is only as good as the person who uses it. The success of these technological advances will rely significantly on the willingness of patients and health-care providers to adopt them and to utilise them to the fullest. In low- and middle-income countries, the initial cost of adoption of these technologies may be a major barrier and needs to be looked into. The development of indigenously designed and manufactured technologies and devices is a welcome trend in this respect. Conventional methods of glucose monitoring are good at assessing chronic hyperglycaemia, but less than ideal in measuring glycaemic variability (GV). Use of FGM offers scope for better quantifying GV and assessing its importance in diabetes complications. There are many innovative non-invasive technologies being developed and tested for monitoring blood glucose and GV. The transformative potential of mHealth technology due to the extraordinary growth of mobile phones, fast growth of mobile networks and technology could render mHealth as a powerful media for providing individual-level support virtually beyond traditional/usual care. There are many apps and devices currently available in the market for diabetes screening and management, however, effectiveness data are lacking. Therefore, mHealth as a viable option in clinical and epidemiological settings for diabetes screening, prevention and management needs to be explored further through robust studies. International Diabetes Federation. Diabetes Atlas 7th edition 2015. IDF; 2015. Available from: http://www.diabetesatlas.org/. [Last accessed on 2016 Mar 29]. Global Report on Diabetes. WHO Publications; 6 April, 2016. Cohen LB. New Technologies for Managing Diabetes Mellitus. PSAP VII (Book 5). American College of Clinical Pharmacy; 15 January, 2011. Garabedian LF, Ross-Degnan D, Wharam JF. Mobile phone and smartphone technologies for diabetes care and self-management. Curr Diab Rep 2015;15:109. Norris TE, Hart GL, Larson EH, Tarczy-Hornoch P, Masuda DL, Fuller SS, et al. Low-bandwidth, low-cost telemedicine consultations in rural family practice. J Am Board Fam Pract 2002;15:123-7. Available from: https://www.healthit.gov/providers-professionals/faqs/what-electronic-health-record-ehr. [Last accessed on 2017 Apr 30]. Definition and Diagnosis of Diabetes Mellitus and Intermediate Hyperglycaemia. Geneva: World Health Organization; 2006. Aailable from: https://www.idf.org/webdata/docs/WHO_IDF_definition_diagnosis_of_diabetes.pdf. [Last accessed on 2016 Mar 29]. Ramchandani N, Heptulla RA. New technologies for diabetes: A review of the present and the future. Int J Pediatr Endocrinol 2012;2012:28. Available from: http://www.integrity-app.com/pressreleases/glucotrack-maker-presents-scientific-data-demonstrating-reliable-accuracy-and-precision/. [Last accessed on 2017 Apr 30]. Stout P, Pokela K, Mullins-Hirte D, Hoegh T, Hilgers M, Thorp A, et al. Site-to-site variation of glucose in interstitial fluid samples and correlation to venous plasma glucose. Clin Chem 1999;45:1674-5. English E, Milosovich ET, John WG.In vitro determination of hemoglobin A1c for diabetes diagnosis and management: Technology update. Pathol Lab Med Int 2014;6:21-31. Availble from: http://www.medicalexpo.com/medical-manufacturer/glycated-hemoglobin-analyzer. [Last accessed on 2017 Apr 30]. Bode BW. Clinical utility of the continuous glucose monitoring system. Diabetes Technol Ther 2000;2 Suppl 1:S35-41. Kim HS, Shin JA, Chang JS, Cho JH, Son HY, Yoon KH, et al. Continuous glucose monitoring: Current clinical use. Diabetes Metab Res Rev 2012;28 Suppl 2:73-8. Kalra S, Gupta Y. Ambulatory glucose profile: Flash glucose monitoring. J Pak Med Assoc 2015;65:1360-2. Agrawal P, Welsh JB, Kannard B, Askari S, Yang Q, Kaufman FR, et al. Usage and effectiveness of the low glucose suspend feature of the medtronic paradigm Veo insulin pump. J Diabetes Sci Technol 2011;5:1137-41. Heinemann L, Fleming GA, Petrie JR, Holl RW, Bergenstal RM, Peters AL, et al. Insulin pump risks and benefits: A clinical appraisal of pump safety standards, adverse event reporting, and research needs: A joint statement of the European Association for the Study of Diabetes and the American Diabetes Association Diabetes Technology Working Group. Diabetes Care 2015;38:716-22. Trevitt S, Simpson S, Wood A. Artificial pancreas device systems for the closed-loop control of type 1 diabetes: What systems are in development? J Diabetes Sci Technol 2016;10:714-23. Haidar A, Legault L, Messier V, Mitre TM, Leroux C, Rabasa-Lhoret R, et al. Comparison of dual-hormone artificial pancreas, single-hormone artificial pancreas, and conventional insulin pump therapy for glycaemic control in patients with type 1 diabetes: An open-label randomised controlled crossover trial. Lancet Diabetes Endocrinol 2015;3:17-26. Wright BM, Bellone JM, McCoy EK. A review of insulin pen devices and use in the elderly diabetic population. Clin Med Insights Endocrinol Diabetes 2010;3:53-63. Available from: http://www.itu.int/en/mediacentre/pages/2016-PR30.aspx. [Last accessed on 2017 Apr 30]. Nyenwe EA, Ashby S, Tidwell J, Nouer SS, Kitabchi AE. Improving diabetes care via telemedicine: Lessons from the Addressing Diabetes in Tennessee (ADT) project. Diabetes Care 2011;34:e34. Toledo FG, Ruppert K, Huber KA, Siminerio LM. Efficacy of the telemedicine for reach, education, access, and treatment (TREAT) model for diabetes care. Diabetes Care 2014;37:e179-80. Mohan V, Deepa M, Pradeepa R, Prathiba V, Datta M, Sethuraman R, et al. 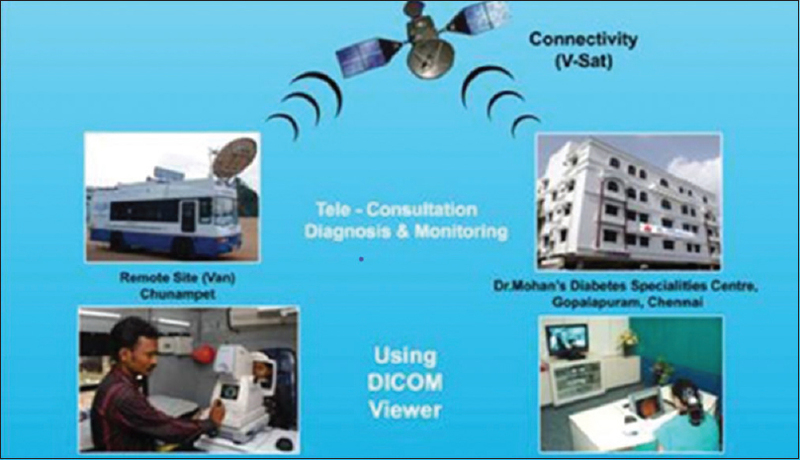 Prevention of diabetes in rural India with a telemedicine intervention. J Diabetes Sci Technol 2012;6:1355-64. Mohan V, Prathiba V, Pradeepa R. Tele-diabetology to screen for diabetes and associated complications in rural India: The Chunampet rural diabetes prevention project model. J Diabetes Sci Technol 2014;8:256-61. DeBuc DC. The role of retinal imaging and portable screening devices in tele-ophthalmology applications for diabetic retinopathy management. Curr Diab Rep 2016;16:132. Ramachandran A, Snehalatha C, Ram J, Selvam S, Simon M, Nanditha A, et al. Effectiveness of mobile phone messaging in prevention of type 2 diabetes by lifestyle modification in men in India: A prospective, parallel-group, Randomised controlled trial. Lancet Diabetes Endocrinol 2013;1:191-8. Pfammatter A, Spring B, Saligram N, Davé R, Gowda A, Blais L, et al. MHealth intervention to improve diabetes risk behaviors in India: A Prospective, Parallel Group Cohort Study. J Med Internet Res 2016;18:e207. Goyal S, Cafazzo JA. 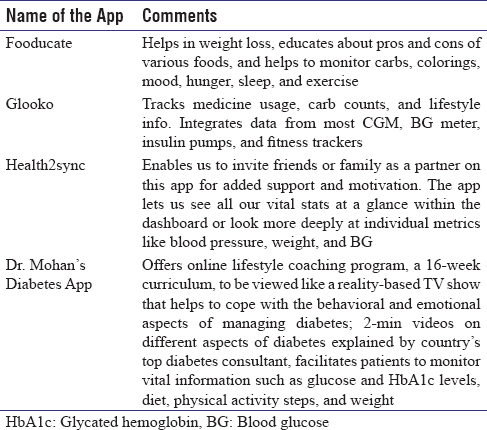 Mobile phone health apps for diabetes management: Current evidence and future developments. QJM 2013;106:1067-9. Available from: http://www.healthline.com/health/diabetes/top-iphone-android-apps#3. [Last accessed on 2017 Apr 30]. Available from: https://www.play.google.com/store/apps/details?id=com.janacare.habits.drmohan&hl=en. [Last accessed on 2017 Apr 30]. Rajalakshmi R, Arulmalar S, Usha M, Prathiba V, Kareemuddin KS, Anjana RM, et al. Validation of smartphone based retinal photography for diabetic retinopathy screening. PLoS One 2015;10:e0138285. Ryan ME, Rajalakshmi R, Prathiba V, Anjana RM, Ranjani H, Narayan KM, et al. Comparison among methods of retinopathy assessment (CAMRA) study: Smartphone, nonmydriatic, and mydriatic photography. Ophthalmology 2015;122:2038-43. Mohan V, Shah SN, Joshi SR, Seshiah V, Sahay BK, Banerjee S, et al. Current status of management, control, complications and psychosocial aspects of patients with diabetes in India: Results from the DiabCare India 2011 study. Indian J Endocrinol Metab 2014;18:370-8. Wu RC, Straus SE. Evidence for handheld electronic medical records in improving care: A systematic review. BMC Med Inform Decis Mak 2006;6:26. Montori VM, Dinneen SF, Gorman CA, Zimmerman BR, Rizza RA, Bjornsen SS, et al. The impact of planned care and a diabetes electronic management system on community-based diabetes care: The mayo health system diabetes translation project. Diabetes Care 2002;25:1952-7. O'Connor PJ. Electronic medical records and diabetes care improvement: Are we waiting for godot? Diabetes Care 2003;26:942-3. Pradeepa R, Prabu AV, Jebarani S, Subhashini S, Mohan V. Use of a large diabetes electronic medical record system in India: Clinical and research applications. J Diabetes Sci Technol 2011;5:543-52. Mohan V, Radhika G, Vijayalakshmi P, Sudha V. Can the diabetes/cardiovascular disease epidemic in India be explained, at least in part, by excess refined grain (rice) intake? Indian J Med Res 2010;131:369-72. Mohan V, Anjana RM, Gayathri R, Ramya Bai M, Lakshmipriya N, Ruchi V, et al. Glycemic index of a novel high-fiber white rice variety developed in India – A randomized control trial study. Diabetes Technol Ther 2016;18:164-70.